With increasing demands upon the control of flows within water systems, modern mechanical flow control regulators are now required to provide increasingly accurate and reliable operation. Flow regulators have the task of restricting the pass forward flow from the storm water retention system to a pre-set value. ALPHEUS flow regulators are a proven, cost-effective technique for regulating flows from as little as 6 l/s for storm water and 2 l/s for surface water applications. The ALPHEUS regulators are designed with automatic blockage release, operating within either the dry or wet side of the control chamber. 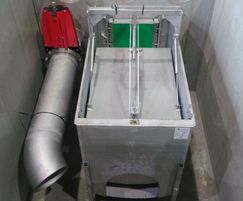 They can be retrofitted into existing chambers or supplied as a new stainless steel package chamber. The ALPHEUS - AT flow control system has been designed for semi-dry or dry installation in the flow control shaft. In this case, the system operates independently without external energy. In dry weather, the water flows unhindered through the throttle. If the water level rises above a certain level during rain, the float will be activated and starts the precise regulation. An automatic regeneration system is integrated for blockages during flow regulation work. ALPHEUS - AS and AA flow control systems have been designed for wet installation in the flow control shaft. Both systems work by means of a pressure bell housing which regulates the flow quantity using an interior float.